The latest from Billy Syndrome caps off a trilogy of CD's that started with Now (see AI #14) and left off with Between (see AI #23). 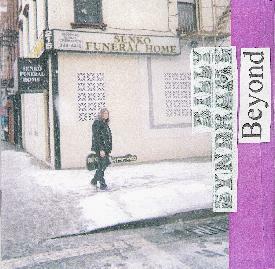 Described as "an anti-folk future album with new 21st century street anthems", Beyond was written and recorded over a 24 period (across 3 days of recording) when Billy was given the opportunity for some free studio time. The songs are some of the most stripped down I've heard from the Syndrome camp, but if after all these albums I've clued in at all to the anti-folk thing then I'm guessing that this is the very essence of the genre. At just 34 minutes this is a relatively short album, but it's full of Billy Syndrome fun music and lyrics. Where would a folk album be without an anti-war song? "Human Shield" covers that base, but comes out blazing in trademark Billy Syndrome raw and screaming garage rock style. "We Will Love Again" is another highlight, being a thrashing psychedelic garagey freakout love song. And talk about freakouts... the instrumental "Audacity Blues" takes the Blues deep into the garage for 2 minutes of brain shocking sonic fun. The strangeness continues on "Vultures Are Flying", with Cliff Ferdon's trumpet adding a wailing anti-jazz (I just made up that genre) edge to the already mindfucked synth insanity that backs Billy's rant against the evils of money. "Micky's Mushrooms" is one of the hardest rockers of the set and is "fronted" by what sounds like a gaggle of incessantly quacking ducks. A WILD song and one of my favorites. "Adam Zola The Biofanatic"is a fun acoustic song about a genius scientist who rearranges his molecules to become the biosphere he's obsessed with. And the set closes with the dissonant acoustic freaked out folk-bluesy "Bottom Of The Well". Anti-folk... it's fer what ails ya. Open minded underground music enthusiasts who enjoy music that is raw, fun and completely from the heart should check out this, or really anything, by Billy Syndrome.